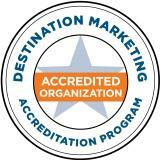 The Chapel Hill/Orange County Visitors Bureau, as Chapel Hill and Orange County NC’s official Destination Marketing Organization, is accredited by the Destination Marketing Accreditation Program (DMAP) of the Destination Marketing Association International, 2025 M Street, NW, Suite 500, Washington, DC, 20036 USA, 202-296-7888. There are no current job openings for the Visitors Bureau. For information about job openings with Orange County, please go to Orange County Job Opportunities. The mission of the Chapel Hill/Orange County Visitors Bureau is to develop and coordinate visitor services in Orange County and to implement marketing programs that will enhance the economic activity and quality of life in the community. To position Orange County as a desirable meeting or vacation destination to select visitor markets, with careful consideration of the needs and assets of the communities that comprise Orange County. To work in cooperation with community organizations to achieve an effective, coordinated and comprehensive marketing program with high-quality collateral materials, programs and services. To serve as a countywide leader in developing strategies for consistently providing quality visitor services to the travelers who visit Orange County. To encourage longer stays, increased spending and repeat visits of travelers to Orange County. To examine the range of visitor services available, to identify unmet needs and to encourage private businesses to meet those needs, as appropriate. To operate in a manner that contributes to the economic development and quality of life that comprise Orange County. The Chapel Hill/Orange County Visitors Bureau will serve as a leader in tourism economic development through creative marketing, as well as active community and product development support. No property taxes are used to fund the Visitors Bureau. The Visitors Bureau is funded by occupancy taxes collected from guests of county accommodations. Orange County collects a 3% occupancy tax from all guests, which the Board of Commissioners has dedicated to the operation of the Visitors Bureau. The Town of Chapel Hill levies an occupancy tax of 6% (which includes the county’s 3%) and allocates a portion of these receipts to the operations of the Visitors Bureau.